I’m going to show you how to make salmon that is Baked in Foil. Full of flavor and nutrition! When it comes to fish, I’m not very skilled on how to cook it but this Healthy Grilled Salmon Recipe is foolproof! I’m going to show you how to make salmon that is Baked in Foil. Full of flavor and nutrition! Besides the way I’m going to show you, they are many different ways to prepare Salmon. The most popular methods are: baking, broiling, grilling, pan-searing, or poaching them. If you want to add extra flavor, you can also add a marinade just like you would for chicken and beef. Before cooking, you can either leave the skin on or remove it. I find it easier to just leave it on and remove it after it’s been cooked. It comes off much easier. If you decide to take it off, place on a cutting board with the skin side down. 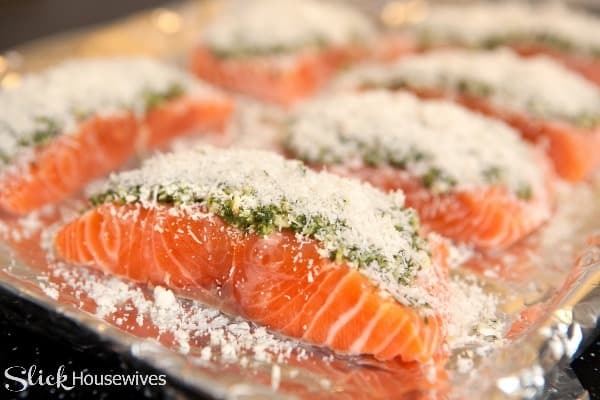 **Tip: Sprinkle one end of the salmon with salt to make the fish less slippery. Hold the salted end and use a sharp knife to cut between the flesh and the skin slowly, until the fish pulls away from the skin. Voila! There are many benefits of eating salmon. I didn’t realize this, but eating salmon is great in the treatment of osteoarthritis and other inflammatory joint conditions. It also has been shown to reduce the risk of depression, and cognitive decline in the elderly. 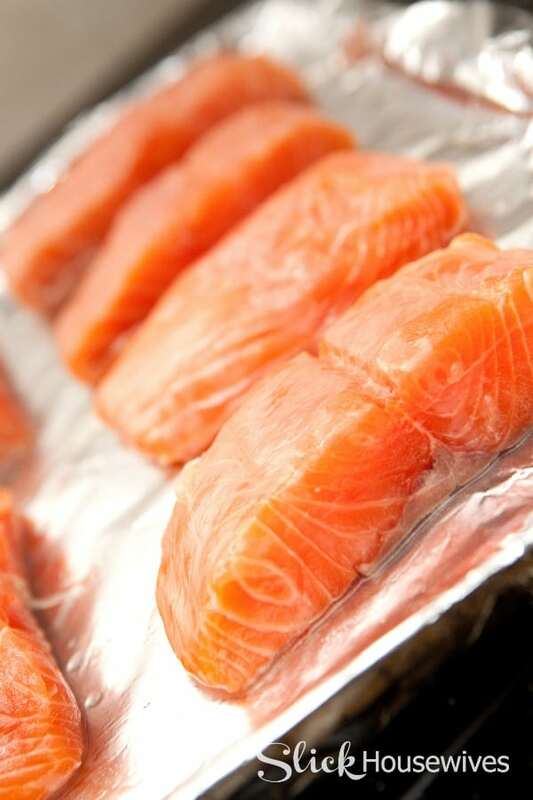 This is due to the fact that salmon contains high levels of the omega-3 fats, EPA and DHA! If you have a low level of Vitamin D, then eat up because Salmon is also an excellent source of Vitamin D.
According to the Monterey Bay Aquarium Seafood Watch, Wild-caught Alaskan salmon (also called Chinook, King, Keta, Coho, Sockeye or Sake) is named a “best choice.” I would try to avoid farm raised salmon if possible. You can use the pocket guide above from the Monterey Bay Aquarium Seafood Watch, to reference when trying to buy and get the Best Salmon to Eat. I always try to avoid salmon with a strong fishy odor. Look for moist, clean cut fillets. In a small bowl, whisk together basil pesto, garlic, olive oil, white wine vinegar, and salt and pepper to taste. Spoon the Basil Pesto mixture over the salmon. 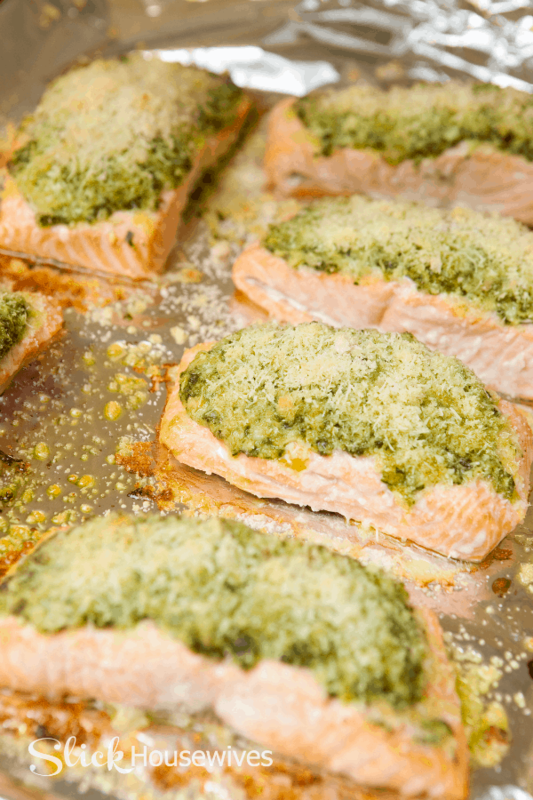 **You might be wondering what sides to make with the baked salmon! 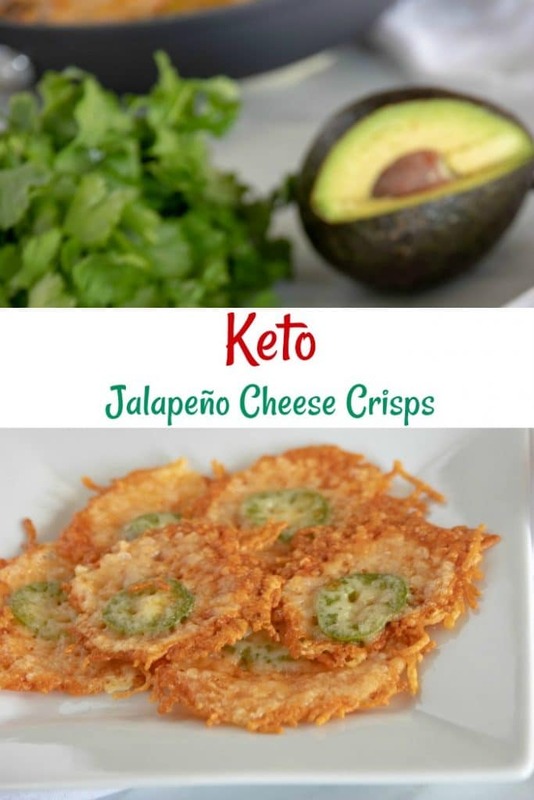 We like to pair it with rice, quinoa, asparagus, baked potato or even a side salad would be delicious! Be sure to check out this book on The Ultimate Guide to Salmon Cooking on Kindle Unlimited for Free! Next, sprinkle the parmesan cheese on top of each one. Note: Baking time may need to be adjusted depending on the thickness of the salmon. 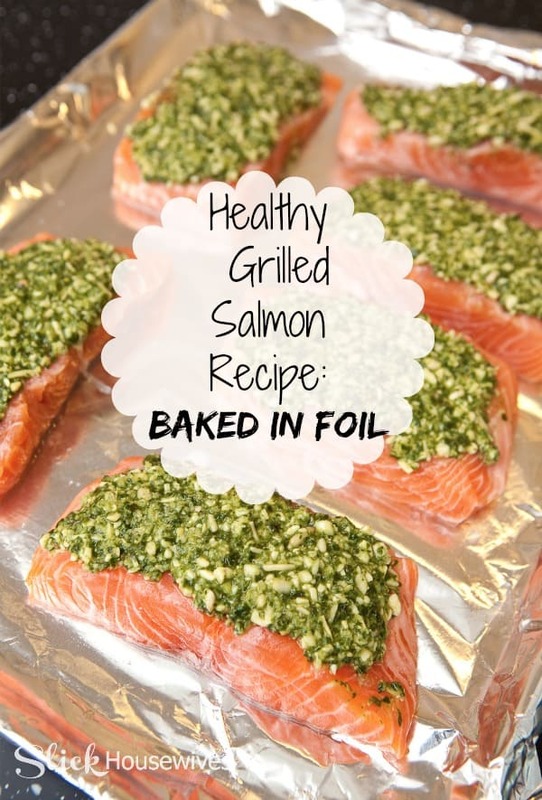 Hope you enjoyed our little tutorial on making Healthy Grilled Salmon Recipe: Baked in Foil! I love salmon on the grill. It's one of my favorite foods.